Sagan (left) has disappointed Colbrelli (right) twice on this year's Tour. Time for revenge? "Sonny Colbrelli will be unlucky if he leaves this Tour without a stage win. He's ridden well to finish second on Stages 2 and 5 and today's stage is not unlike the finish into Gansingen in the Tour de Suisse, where he bested Gaviria and Sagan…"
In a pre-Tour preview of Stage 13, organisers claimed that the day was an attempt to "put a smile back on the faces of the sprinters" after the days of cobbles and mountains just gone. Unfortunately for organisers, there aren't many sprinters left in the race. 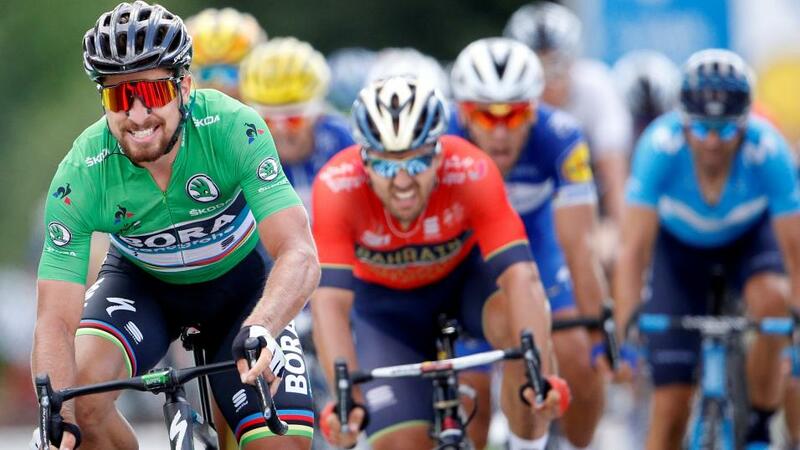 Mark Cavendish and Marcel Kittel were both eliminated on Stage 11; and Andre Greipel, Fernando Gaviria, and Dylan Groenewegen all abandoned on Stage 12. Those sprinters that are left will welcome the route. It's a short stage at under 170km, which slowly descends across its course, with only a couple of relatively insignificant categorised climbs along the way. The finish into Valence is not entirely straightforward - it kicks up a little in the last kilometre and there's a tricky roundabout to negotiate 400m from the finish - but it should end in a bunch sprint. Unless, of course, the absence of so many headline sprinters mean there are no teams willing to bring back a break-away? Given it's taken a while for news to filter through and be confirmed about abandonments, the markets for Stage 13 are still forming at the time of writing. When things settle, Peter Sagan will likely be favourite at around [3.25], with Arnaud Demare not far behind at around [4.00]. A valid case can be made for either of the pair. On balance, Sagan has looked the best sprinter in this year's Tour, and the finish - whilst not perfect - will suit him well enough. Meanwhile, Demare has been tactically naïve on earlier stages and could have challenged for a win on a couple of occasions had he timed his efforts better. The climb in the final stages will suit Demare - he can grind a big gear better than most on these kinds of finishes - and a victory for the Frenchman would be no surprise in Valence. Who are the most likely outsiders? Sonny Colbrelli will be unlucky if he leaves this Tour without a stage win. He's ridden well to finish second on Stages 2 and 5 and today's stage is not unlike the finish into Gansingen in the Tour de Suisse, where he bested Gaviria and Sagan. At around [15.00], Colbrelli is the value bet. What effect will the stage have on the overall markets? Any bet in the Points Competition now is a coin toss that asks you to decide whether Peter Sagan will reach Paris or not. He's currently [1.03] to do so. Elsewhere, Julian Alaphilippe and Warren Barguil will presumably lock horns again in a breakaway to contest the King of the Mountain points on the two categorised climbs. As for the General Classification guys, it's a day to take stock and survive. Little can be gained on this innocuous stage, so they will all be focused on staying out of trouble, whilst preparing themselves for the inclines of the Massif Central and Pyrenees to come.